My first actual game of Ancients was played last night between myself and Rich from Chicago Terrain Factory. Rich and I are planning on playing in the doubles tournament at Adepticon 09' so its about time we figure out how to play. Both are armies are close to assembled and he's at least started painting, I am still waiting on my bases from Litko (currently 22 days out!!!!) before I can finish building mine. I took some photos, but since we had a majority of unpainted stuff and I was using dice to proxy guys I was short- I figured it made more sense to use some basic diagrams. Deployment was simple with minimal terrain. Rich won 1st turn. 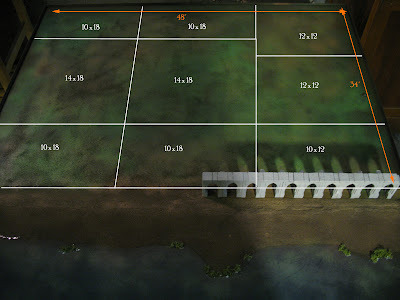 Above is the basic setup,# of models units are in ( ). Rich's units with out numbers are 20 strong each. Turn 1- Both our infantries marched forward while the Arab horse arches swept around my flank. 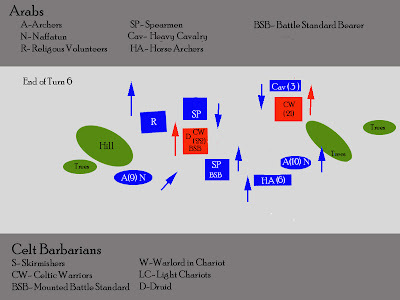 my right most unit of Warriors turned to face them while my Chariots headed straight for his Heavy Cav. My Warlord in his chariot moved and turn to charge his unit of archers all by his lonesome. on the left side My skirmishers and a unit of Arab archers faced off, I took a few causalties this turn from shooting but nothng major. The biggest problem was his Naffatun, inside his archer unit, these lone models shoot fire projectiles that cause Terror!!! Turn 2- Celt leadership in skirmish formation is very low, (5) needless to one of my unit of Skirmishers flee after failing the terror check as soon as they get a look at that high tech fire gun. The other "fires and flees" while being charged by the religous volunteers. My largest block of warriors charge his Spearmen with his BSB, and the combat is locked. My other unit of Warrior with my Druid (who causes Fear) Charge his other unit of Spearmen and the Druid causes them to run away as they are outnumbered. 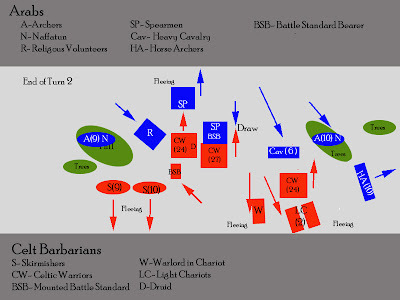 My Chariots get charged by the Heavy Cavalry and dont do so well, one is destroyed and the other two break, this causes my Warlord to make a panic check and he flees as well. The horse archers fire at my warriors and turn retreat, so my warriors on the right side turn to face the oncoming heavy cav. Not going so well for the Celts. and escape with both my Warlord and Warriors in pursuit. The Horse Archers charge and catch my Warlord in the rear, while my warriors escape continuing to follow the heavy cav. My Skirmishers all ran of the table, I am taking alot more losses from shooting with any units to counters. 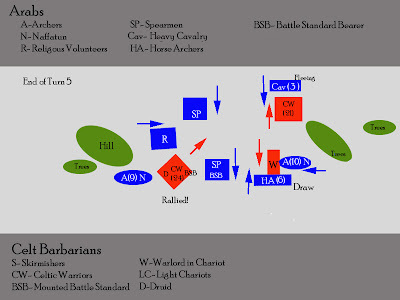 The block of warriors that had drawn 2 rounds of combat with the arab BSB and his Spearmen finally breaks and is Cut down. My BSB had join the unit with my Druid and I was all set to charge the Religious Volunteers, but seeing my largest unit cut down right in front of me caused my Druids unit to make a panic check and they fail! damn! I am in hot water now. My Warlord is rear charged my best unit is fleeing and my other unit is chasing Cavalry on foot and I am surrounded by archers, not good. 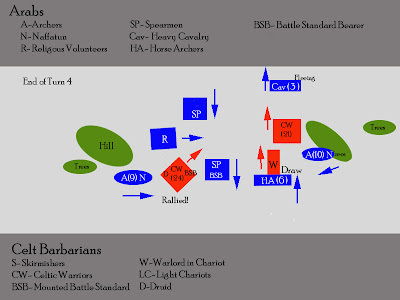 Turn 5- My Warlord hangs in there cutting down some horse archers, losing combat but holding firm, and unit of archers lines up to flank charge. the Arab Heavy Cav Rallies and turns my unit of Warriors pursuing moves ahead hoping to charge next turn. 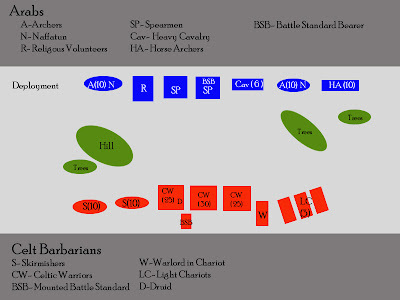 My unit with my Druid and BSB rally and reform to avoid direct charges from the surrounding Arab units. Turn 6- The Arab heavy Cav moves and positions itself for my warriors to charge, Archers charge my Warlord in the Flank and between the Archers and Horse Archers, My Warlord falls in close combat. I take shooting causalites in my BSB/ Druid Unit, the Arabs restrain and don't charge me. 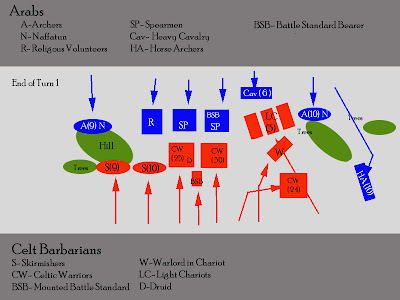 I try to charge the only unit I can see, but am sort, My Warrior facing off with the Heavy Cav charge as well and are just short. Game over. Results- Rich had about 500 in kills plus 2 banners, and a table quarter plus 100 points for killing my Warlord, I had about 150 in Kills and 1 banner, the Arabs win by 650 points and in a 1000 point game. that my friends is a massacre!. 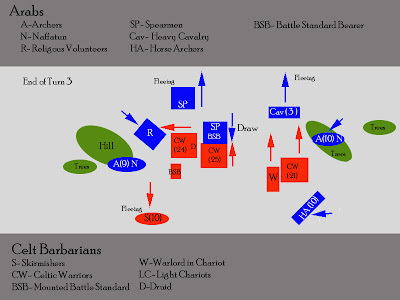 I learned alot in the match, Pyschology is huge in a game without a magic phase..Terror from the Naffatun is brutal and in WAB the odds of people like Skirmishers rallying is just luck..I shouldn't have fire and fled and leaving my Warlord alone and not putting him the unit with Chariots was a bad idea.. plus my BSB should have been a unit of 30 Warriors from the get go just for the combat res. Anyway while rules are basically 5th Ed WFB the game plays differently enough from current WFB that you really need to think about it. Every unit is pretty well balanced so things like 2 ranks of spears have alot of impact where I thought my 30 rabid Celt warriors would bust right thru.. well with only 6 attacks, hitting and wounding on "4"'s a bad roll and you will lose combat res...to 10 spear attacks more times than not. Anyway live and learn we'll get the hang of it...I think thou this is going to be a good team army, Arabs and Celts!...Who have thunk! .. Thanks Rich! High Elves (Black)- High Elf Noble? High Elves (Purple)- High Elf Noble? MASSACRE -VAMPIRE COUNTS 7EP all or nothing!!! Special Characters will join their respective armies via special events and your Empire's accomplishments. 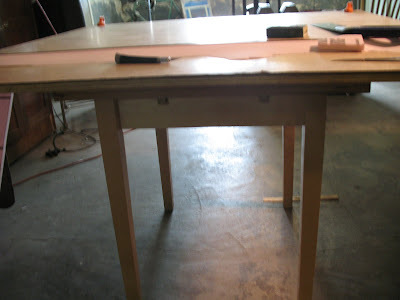 Phase two has consisted of finishing the table as essentially a nice plot of land on which the city will be built. Looks like a nice piece of real estate in 28mm scale it's about an acre sitting along a river. I finished it in the usual way I've finished all my tables- sand for texture, prime black, then spray with nice mottle of hunter green, leafy green, and two brown shades. 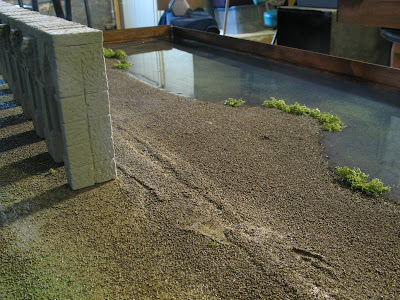 The water is "realistic water" by Woodland Scenics The water section is about 1/8" deep at approximately 12 x 48 inches. I used about a bottle and a half (24 ounces) which costs $30.00 to do the water section. (that's vs GW's 8 ounces for $25.00) So far the overall cost of what you see (considering the table base was free) is about $75.00, that's adding about $10.00 for paint costs. 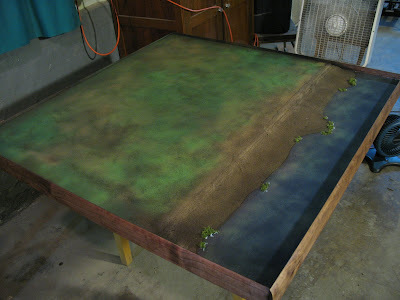 Keeping the table as empty piece of terrain suits a bunch of purposes, since all the city pieces will be modular and on their own base..I can use this table for all kinds of gaming. 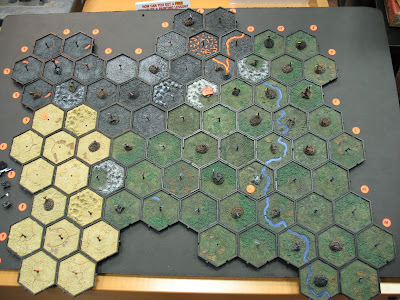 Just pull off the tiles and there is your piece of land to set up a new design or just have a wide open battlefield. Plotting the city is an interesting task, while speaking to my pal Bill about this the other night he brought up a great point in that not to make all the tiles the same size because it makes it very easy for any range guessing by looking at the lines on the bases of each piece of terrain. The schematic below shows the proposed layout. I am assuming when they are done I'll have a little bit of more size discrepancy as I make each piece to a custom snug fit. The next step is to finish the wall which you see portion of in the photo's. I have decided to get rid of the bridge you saw in the phase one...due to the size and how a road leading to such a large structure impacted the overall layout of the city. 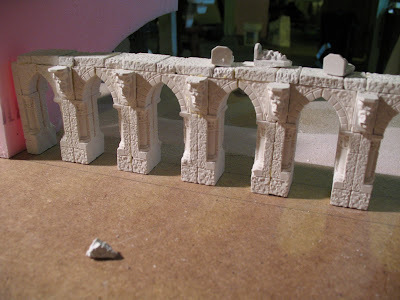 losing the bridge gives me an opportunity to build more of that cool arched wall, some of it will be covered in block stone, with some totally collapsed and some exposed. Finishing the wall will essentially be phase 3 and the modular tiles themselves will be the later phases. I steered myself away from making the majority of buildings out of Hirst blocks in favor of terrain by a variety of manufactures. Obviously that's going to cost alot more, I'll probably spend a couple hundred on raw plastic and resin terrain over building cheaply with plaster, but the time savings over going the all plaster route is definitely worth it to me. We are about to start our 4th Mighty Empires campaign over at my local GW shop ( Oak Park). After the overall player lethargy that had set in after the last campaign I had thought we'd be awhile before a new one came to be but, nope. The demand was there big time, 1/2 the old crew was ready to go and we no problem filling up the extra 6 slots. If fact if the store was bigger and could accommodate more games..I think we could fill out 16, maybe even up to 20 players. It's a good commentary on Warhammer Fantasy as a game that it can draw people in long term and continually promote itself by simply existing and being played in a public arena. I just don't see that longevity and constant player growth with the other game systems. While 40K may be GW's Cash Cow, WFB seems to just build long term steady growth that as a gamer you can't help but appreciate. Tomb Kings- Imatra's Undying Legions led by King Imatra of Kurast. Evervigilant in protecting the Lands of the Dead from any and all invaders. A diplomatic force dispatched by Lord Mannfred Von Carstein of castle Drakenhoff to "negotiate" with Sylvania's neighbors & act as wardens "protecting" the Von Carstein Lands. Speaking of Mighty Empires and the World of Warhammer check out what I stumbled upon on Youtube. 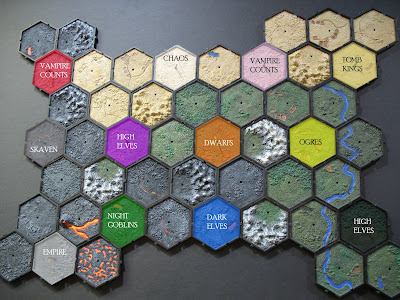 The entire world, yes- that's the entire World of Warhammer made out of Mighty Empire tiles...I don't want to think of what went into that, well actually I do. They say its roughly 10,000 tiles...that's 208 ME boxes @ $45.00 a shot retailing out at $9375.00 before paints and labor...hope they got the employee discount..if that's at Warhammer World...next time I am in the UK, I am making the special trip just to see that. Spent some time getting one of those new 3 column templates going for the blog. Allows me to add alot more content without have to scroll down forever. I also added a live Blog Roll, the community feed from Chicago Terrain Factory, galleries to my painted armies and bunch of useful links. I hope you guys like the changes. I am going back and forth about the color scheme and look of the blog as I made a header in photo shop that doesn't work with this scheme. I've got a poll going for the next week in hope to gets some feedback on the future look of the blog. So let me know what you think. Coming soon.... pics of my Celt Barbarians, Osgiliath Phase two, a couple battle reports, including one you don't see everyday a Battle report for Warhammer Ancient Battles. 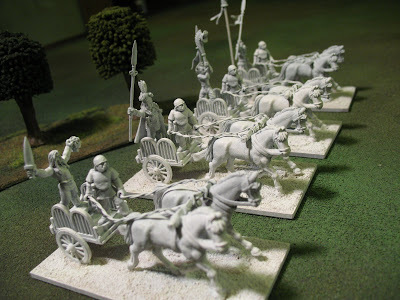 By popular demand there is another Mighty Empire campaign is the works, seems we got a lot of new people turned onto fantasy battles at our local shop as we have six new players..this one's going to be short and bloody. 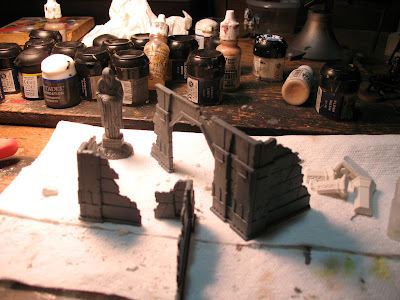 I started on my latest terrain project about a month or so ago, I am calling it the "Osgiliath Project" as the below photo was my inspiration shot. 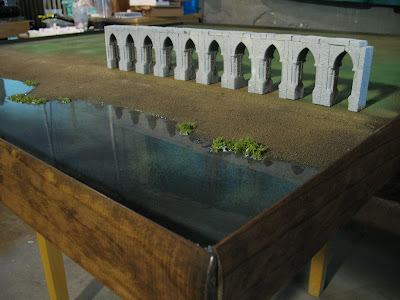 In reality it's going to be a 4 x 4 city-fight table with a gothic/ fantasy theme that can be used for a variety of games. I had originally intended to do the majority of the table in Hirst Art plaster blocks. However after laying out the design it did seem the overall scope was somewhat daunting. 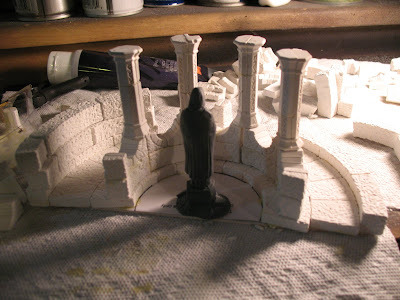 After a long weekend of plaster casting and some building attempts I soon realized if I wanted this done this year I was going to have to go with a combination of Hirst structures with plastic and foam models to supplement. In the above shot you can see how the arched wall, the beach and the bridge all come together, I laid out paper plans of the other buildings to make sure the city's shape seems logical and playable. above pics is one of my early Hirst builds..the problem I had with constuction is the time it takes to shape each block when putting stuctures together. 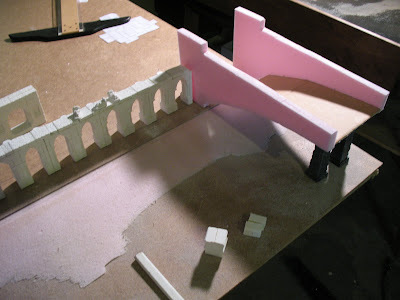 As the large amount of casts required for just a single structure( one mold 15-20 times) combined with my lack of experience casting led to many uneven blocks that had to be shaped. I could have built a 1/2 dozen resin or plastic buildings in the time I spent screwing around building with Hirst blocks this weekend. 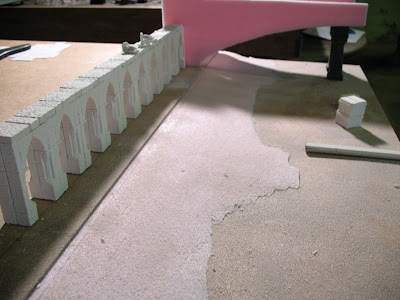 a long shot of the Riverbank, this portion is coming out fine, the archwall sections are a complete mold I borrowed from Rich at Chicago Terrain Factory. The sections were actually pre cast by rich and I got them for another project that I ended up not needing to do..I just cut the middle block of each arch with a coping saw and glued them together in sections to create the arched wall. I also borrowed the mold so I can cast new pieces as I need. 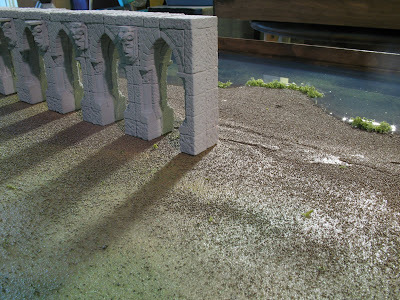 I had this Lord of the Rings terrain sitting around and wanted to use it for the project. 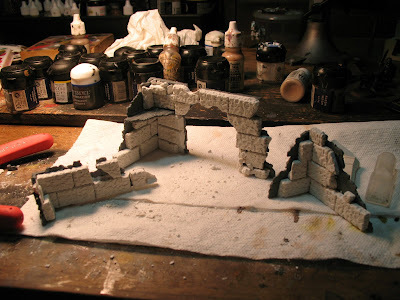 The walls are too thin to be realistic so I beefed them up with some Hirst Blocks and the results are positive- the full set is twice what you see above so they make some nice moveable ruins for the table. These pics are just from the first weekend I worked on this project, and I have progressed quite aways since then. I am still struggling with the overall direction and layout of the city and have several Hirst molds on loan to me, and I have also purchased a variety of plastic and resin kits that will supplement things...whatever comes out best in the end will end up on the table. 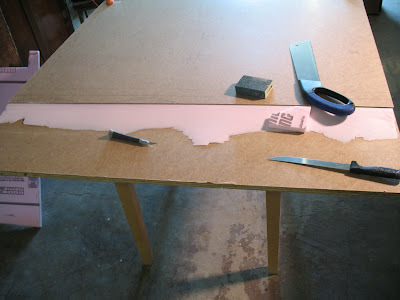 I am making everything modular so I can still use the table for other stuff if need be. This is still away off but expect a "Phase 2" update of my "Osgiliath" before too long. 7/15 @ Games Workshop, Oak Park. and actual shot of the map soon. next campaign it's going to be a much smaller one! Josh's Capital as it was in a mountain hex, but he could completelydestroy it for 3EP and use 2 EP to upgrade 2 of his castles to cities giving him the winning total of 18. This dropped Josh score by 4 leaving him with 14 EP. CHAOS 2EP ( 1 carried over)- With his capital destroyed at 14EP josh's 2 EP can given a new capital but not in valuable his Utopia hex, either an new capital and a city or two new cities only give him 16 EP. EMPIRE 6EP (1 carried over) for two weeks I had to throw away EP that I couldn't use being I was completely boxed in and didn't want to cancel my alliance with the High Elves. in the end my last round option was to destroy my mine and build and city in that hex. costing me 3 of my 6 EP. unfortunatley the last couple rounds I had a total of 8 EP I couldn't use. to bad I couldn't expand! my final score was 11 EP. HIGH ELVES 2EP- Likewise Billy had some hard luck with events, things turned around when we got the Dwarf/Empire/ HE alliance happening so we could quit having forced games everyweek. An extra city with Billys final two points give the HE 8EP. LIZARDMEN 2EP- Down to a single hex at one point- Joe came back from the verge of elimination with some key victories and some really strong games like his round 9 match up versus the VC to end with 8EP, and extra city gives with last two points ties with High Elves with the smallest Empire. Our third and largest campaign definitely suffered from player lethargy during the final round, with most the final games being concessions. (a lot of that being due to the group having to get the shops Games Day table ready) In retrospect 18 weeks was really just too long to keep everyone motivated- particularly when you its clear you can't win, are blocked into playing the same person every week, or suffering from a rough losing streak. not mention we had three drop outs due to real life over that extended period of time. Eric had to drop due to time commitments, Erik got a job in DC and moved. Jeff got promoted and was running all over the place and flying to Baltimore once a month. allot can happen to any group of adults in 4 and half months so what we did get accomplished was great. The good news is the expanded ME rule set we are using has been tweaked considerably and it pretty clear what worked and didn't. My immediate impressions of where to go next are pretty clear.- Tweaking some the strategic events- dropping the ones that where never chosen or useless and coming up with few new ones. Some of the campaign events are either too powerful, (i.e -free items for the whole campaign need to get dropped and replaced with weekly bonuses) I am sure some others need to be tweaked as well. The mandatory challenge rules seemed to present the biggest problem across the board. When guys are climbing over each other to take Diplomacy everyweek in order to play someone different in the new round there is obviously a problem. 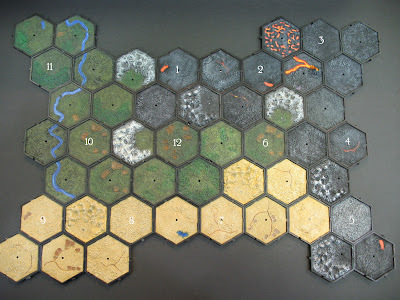 My solution is to drop the mandatory challenge rule entirely in favor of a smaller map, ideally 12 players on 48 hexes. Smaller map will force territory challenges and prevent to much land hording and "turtling" basically the same way the challenge rule had intended. Hopefully this will solve numerous problems. Formal alliances are going to be dropped completely, in favor of informal alliances among players. Team games will be by player choice and each team member needs to use a single army organization chart as sharing one army organization chart clearly presented balance issues depending on the participants. 3000 point games led to being problematic as well as time they take led to them not being played at the shop and many times not getting played at all due to real life getting in the way 2000 point games will always be the default with exception of potential 3K+ games for Capital invasions. Also I want to incorporate 1000 point games in to mix. 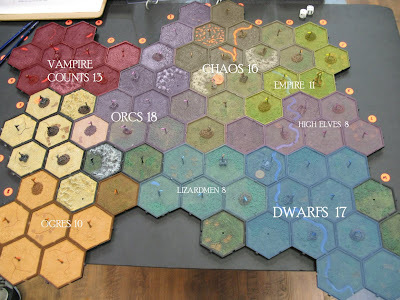 My goal for the next campaign it to get 6 games played every campaign night, and with a new cut off time of midnight 1000 point games will come in handy. Lastly we probably need to return to a weekly format, the scuttlebut I am hearing is the potential of a 40K campaign on friday nights...so going back to weekly or semi weekly (say 6 rounds over 8 weeks) should be pretty doable. Overall I had a great time and look forward to the next one. We have alot of new blood interested and with only about half of this crew probably returning for next campaign should bring some interesting things plus alot of the guys will be trying new armies which will be cool. Me, I still be playing Empire..my VC are too far off from being game ready and I have to many other commitments..if I can hobble together a my all Goblin army together thats a possibility- but Empire has some many options..I still feel like I am getting the hang of it. Thanks to everyone who participated in this and congrats to Anthony's Orcs who win the last two campaigns, he is the man to beat!